These monoculars are a copy of the German monoculars that you can find in some optic shops. 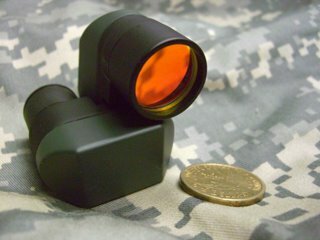 The monocular is very small and produces sharp clear images, the maginifcation factor is not enormous so I find it better to magnify close objects than to identify distant ones. For example it is great to check buildings, cars etc across a street, they provide a very good level of detail. These version has a rubber focusing ring and can be folded and unfolded for transportation. A handy item if you need to play spying games. You can get it from CountyComm they go out of stock often so keep an eye. UV means "Ultra Violet" this in turn means that the light produced by the flashlight is beyond the color violet in the visible light spectrum. 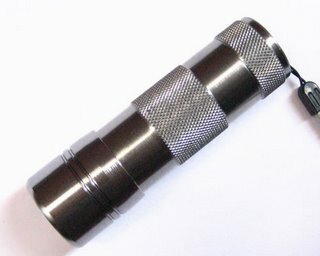 So this flashlight not only produces light, it also produces UV radiation also known as "black light". Some materials have flourescent properties under UV light, white fabrics glow, blood glows as you have seen in the CSI shows, scorpions glow very brightly, you can use it to check currency etc. GID stuff can be charged under UV too. I need to add that UV radiation is really bad for the eyes so you have to avoid looking at this kind of light sources directly and use it with caution. This light from Lighthound has 12 UV leds and produces a good amount of light for normal users. With a retail value of $7 it is affordable if you want to play CSI or hunt for scorpions in your backyard.